I hope my sister-in-law doesn’t mind her gift sharing a post with a dog collar! Both of today’s items go around necks that are dear to me. Giggle. This is a crocheted necklace I made as a birthday gift. I got this idea from Pinterest, and it originated on Craftsy. I used Gloss lace-weight yarn from Knitpicks because I already had some, then put it on a black metal chain. I felt like it needed to hold its shape so I soaked it in some Stiffy (why oh why is it called that?) that was a little watered down, and now it’s just right. It holds its shape without looking…stiff. Now that I’ve made this and given it away, I sort of feel like making another one for myself. I could just make sure not to wear it where Molly is, right? I got some new embroidery software for my birthday. My embroidery machine is a simple, inexpensive model (the Brother PE 500), but it does basically all I think I’d want in an embroidery machine. I’ve considered upgrading to a bigger or more complicated model, but I like things that are simple and straightfoward, and I really appreciate owning things I can afford to replace if a rowdy child “accidentally” knocks it across the room. One thing I wished my machine had was more fonts, and the ability to lay out more than one line of text at a time. So for my birthday I got this Letter It! software. It’s great, and it makes me feel like I can now get even more out of my little machine. It works basically like a word processing program. It comes with a nice variety of fonts, and you can purchase and import more if you want. Then you lay out your text just the way you want it to look on your final product–with multiple lines, mixed fonts, and distortions like curves if you wish–and then just save it as a file that you send over to your machine. 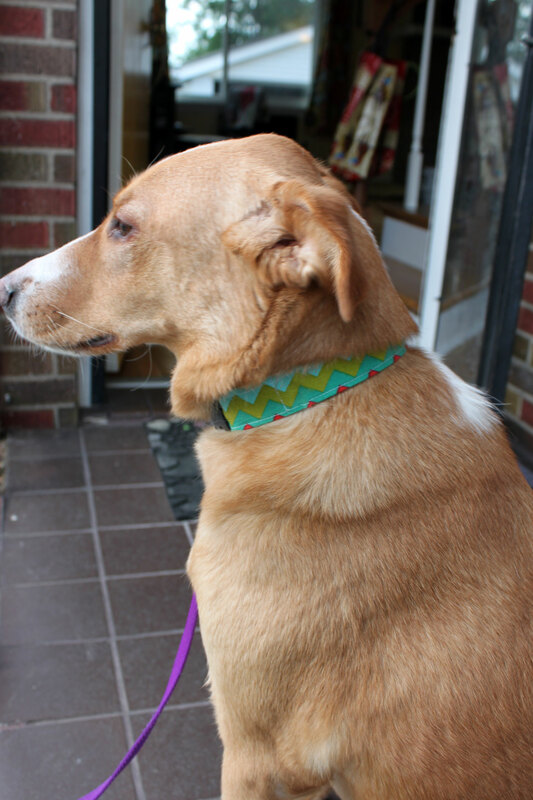 I tried it out on this collar for my dog Belle. I liked being able to line up her name and my phone number just the way I wanted it, and she likes not having a dangling metal tag. As I’ve been glancing back over our summer photographs, I noticed a couple projects I’d like to share. 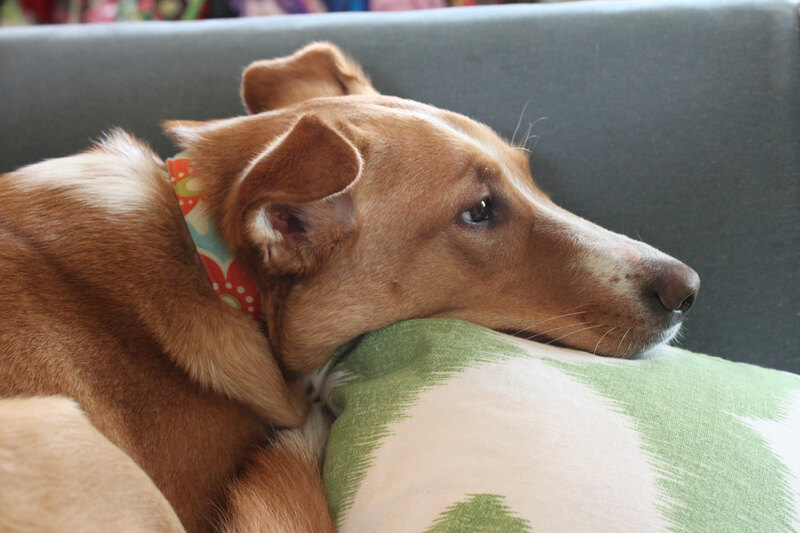 Here is Belle in another of her handmade collars. I make these periodically, whenever I think she needs a cute new one, or I have a pretty scrap that would like nice against her fur. I bought buckles and webbing in bulk because it was so cheap and it really only takes a few minutes to make a one-size collar. She got into the chevron trend with this one. 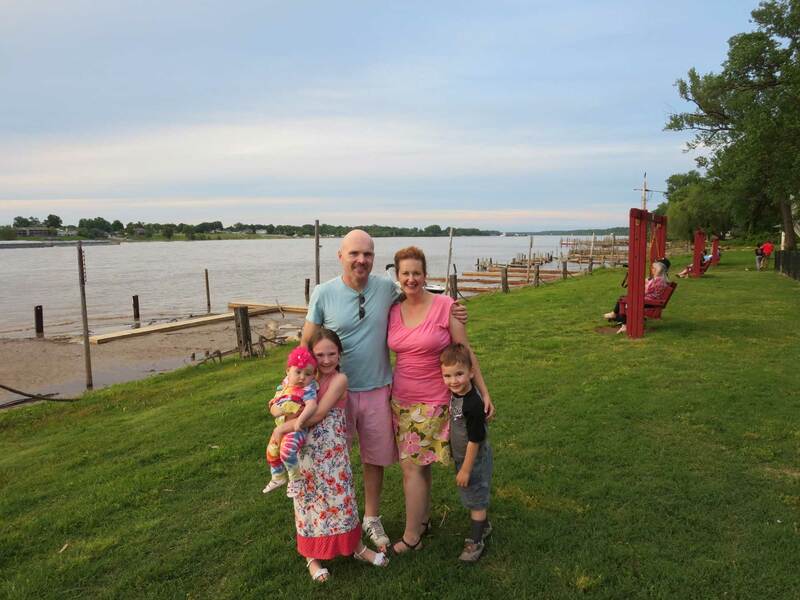 And in this photo, taken by our pretty Ohio River last spring, I am wearing a skirt made from a pattern in The Colette Sewing Handbook. It’s the only pattern from the book I’ve made so far. I loved the way the scallops turned out, and the inside of the skirt looks just as tidy as the outside, thanks to her careful instructions. My only complaint is that I did measure carefully before cutting the pattern but mine was still too large. I think I may try it again in a fall print in a smaller size. I thought my Belle needed to have some new accessories for spring. I made her a collar from scraps of Dorothy’s new dress. These collars are easy to make because I don’t make them adjustable, I just make them the right size to fit my particular dog. I stitch fabric onto 1 inch webbing, sew on a reinforced D-ring, and put parachute clasps at each end. On the second collar I tried something new. 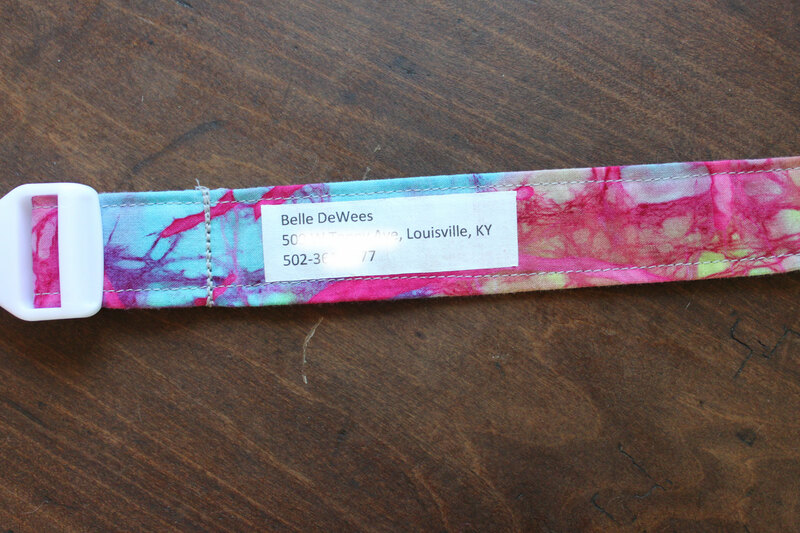 Sometimes it is difficult to get Belle’s metal tags off the thick D-rings on these collars. 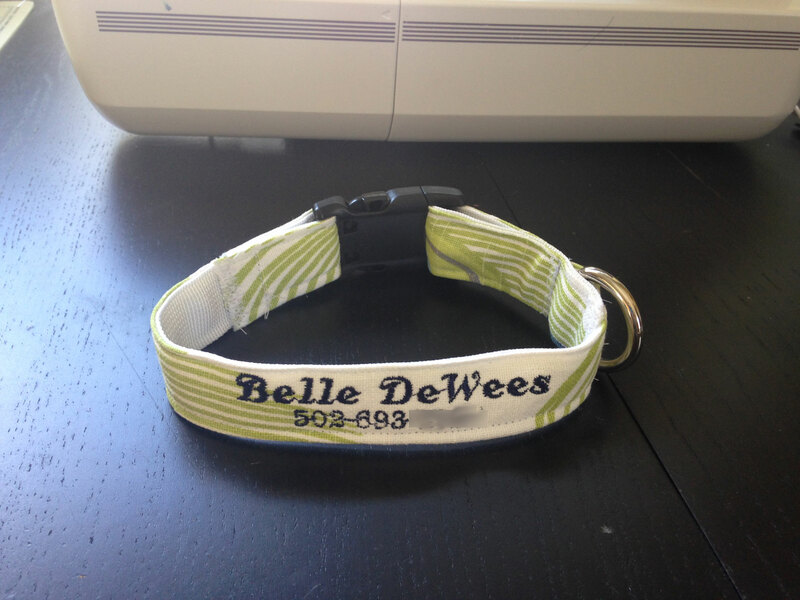 I had a half-sheet of iron-on transfer paper for dark fabrics sitting around, so I printed Belle’s name and address (some of which I rubbed out in the photo) several times onto the sheet, clipped them out, and ironed one on to this second new collar. Now all her pertinent information is right there on the collar instead of dangling below. 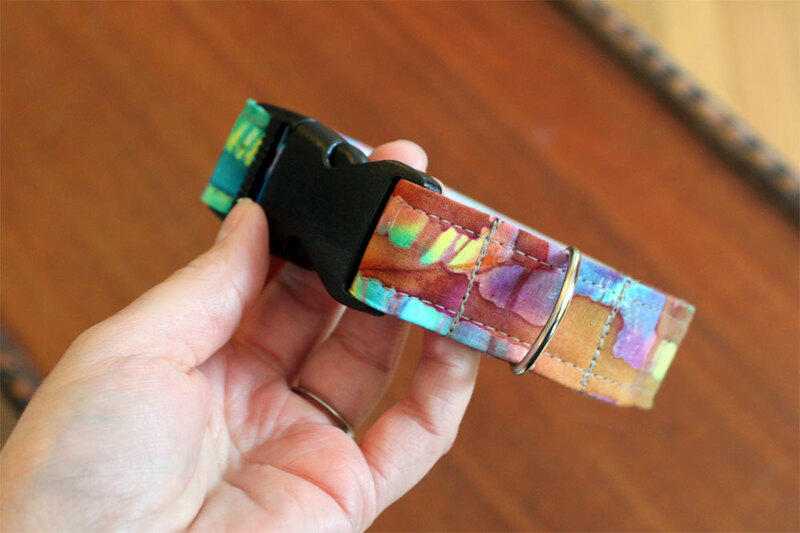 This will be the perfect collar for walks in the woods because she won’t get her tag snagged on sticks, and it will make changing collars easier because it can go right on without my having to change over her metal tag. I saved the other printed addresses for future collars. I feel like this is one of those instances where the final product looks much cuter in my kitchen than it does in this crummy picture. I should outsource my photography to someone with better skills! Disclaimers aside, I gave my kitchen canisters a little update. 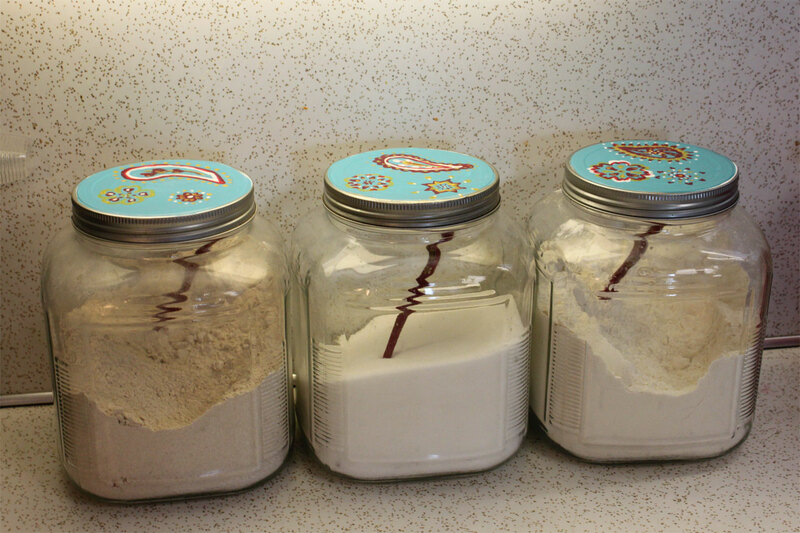 The sturdy glass jars where still in perfectly good condition after ten or so years of wear, but the metal lids were starting to rust. 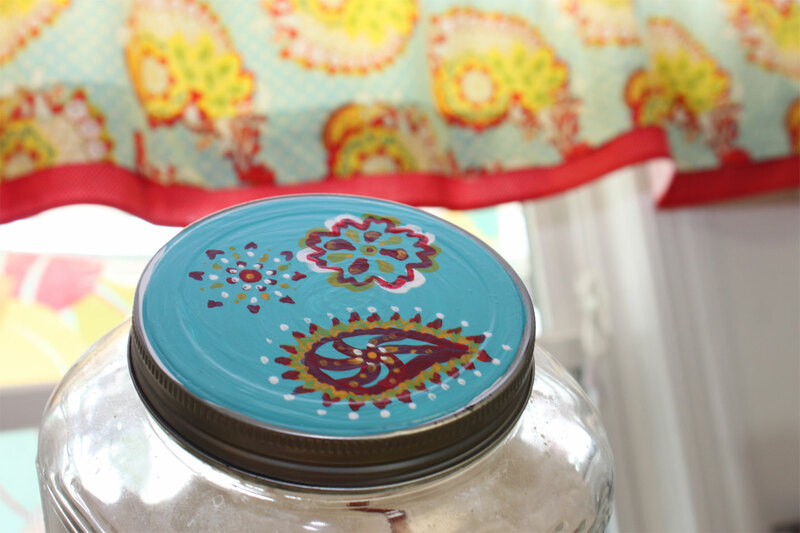 I used craft paint on the lids, then coated them with a polyacrylic sealer. The top of the lids don’t come into contact with food, nor do they need to be dishwasher safe, so I’m hoping this solution stops the rust and improves the look of them. I tried to get a picture of one of the lids in front of the curtains that inspired the design. In retrospect I could probably have stamped on polka dots in the same paint colors and it would have looked nice with less work, but I didn’t think of that in time. 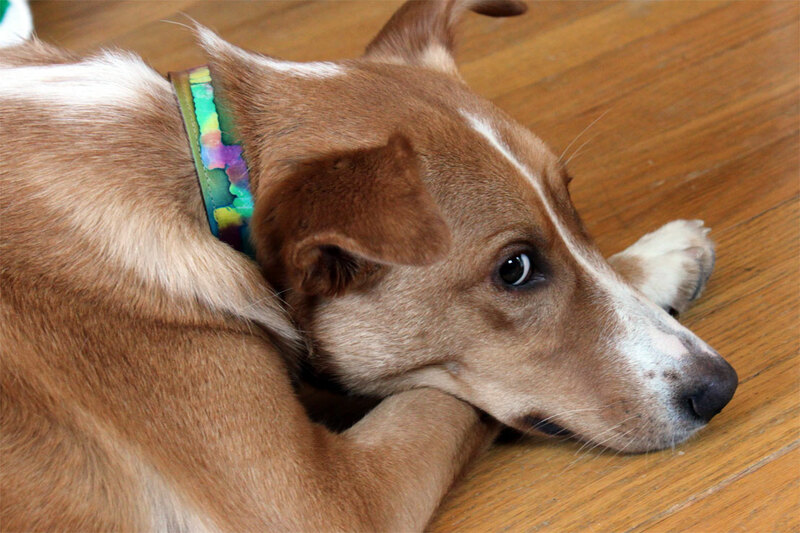 Belle the dog was the victim recipient of another of my recent projects. I’m quite pleased with this one and foresee homemade collars to match every season and holiday in lucky Belle’s future. I purchased inexpensive parachute clips, nylon webbing and D rings at my local crafts shop. I sewed decorative fabric over the webbing and then assembled the collar. This would have been a more complicated project if I’d had to make the collar adjustable, but since I was only sewing it for one full-grown dog I just based it on the measurement of one of her other collars already adjusted to fit her. The whole project only took a few minutes and a couple dollars–now I have to figure out which of my camper fabrics to use on the next one! Belle models her new collar.